Hi, I’m Sandy and I’m a quilter. Okay, now that I have that out of the way, what does that have to do with a tech podcast like this one? Other than the fact that many sewing machines these days are computerized (yay! ), there are many applications that make designing quilts so much easier than using pencil and graph paper. With the latter, one mistake, one time changing one’s mind, means that you must have a very good eraser or start all over again. However, there is now software for designing quilts, including giving lists of how much fabric to use and rotary cutting instructions. It used to be that this software, called Electric Quilt (or EQ), was only available for Windows machines, which meant installing a virtual Windows machine onto our Macs. Ugh. However, a few years ago, the EQ people began offering a Mac-native version, too. Whew! I no longer have to use Windows for anything, which makes me very happy, since I’m really not comfortable in that environment. Okay, so how does this all work? 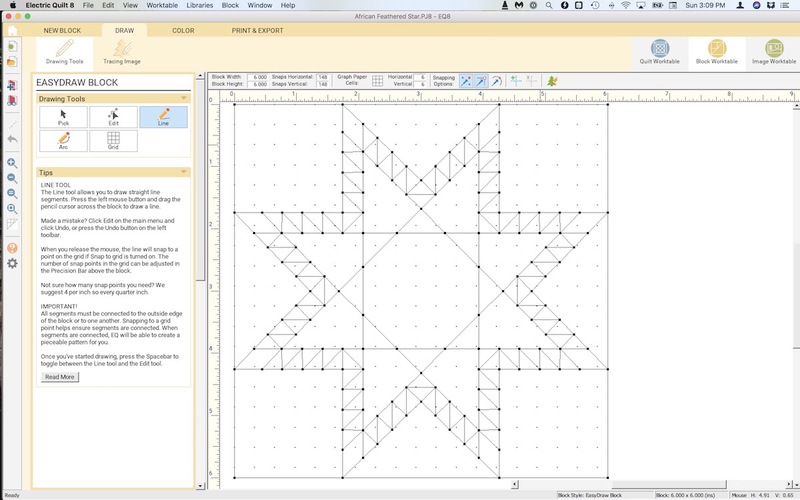 Upon opening the application, you have the choice of designing a quilt from scratch; starting with a “quick quilt project”, which is a layout already designed that you can then modify; or you can open a project that you’ve acquired from another EQ user. 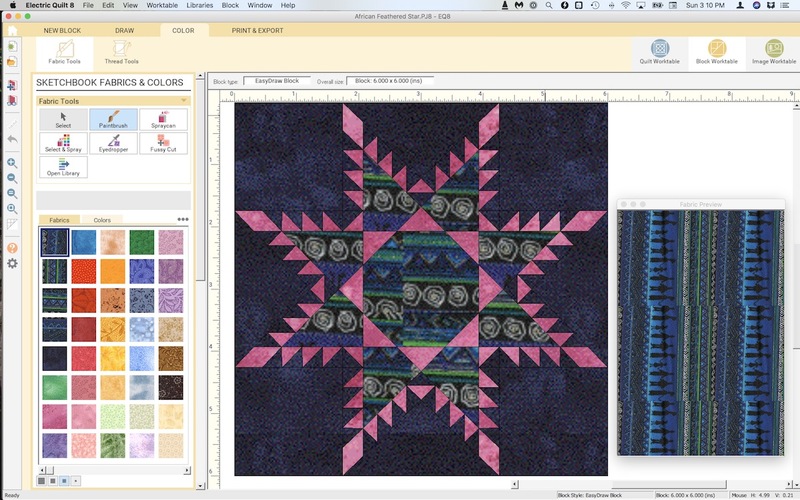 If you’ve opted to design a new quilt or modify an existing one, you can select a layout, which involves selecting how to align rows and columns of blocks — whether straight or on-point — as well as choosing the size of those blocks, whether or not to have sashing (strips of an alternate fabric) between those rows and/or columns, whether to have borders around the whole, and the size and number of those optional borders. There’s a block “library” included, from which you can choose the ones you’d like to use, but you can also design your own blocks. What if you prefer appliqué to piecing? You can draw those shapes, too. You can color both pieced elements and appliqué elements to your heart’s desire, which is a huge advantage since it allows experimentation without wasting fabrics that you might later regret having chosen. Finally, you can print out cutting charts or templates, fabric requirements, appliqué shapes and many other handy and/or essential parts to the quilt. I like to print out the informational parts to PDF and use them on my iPad. Does this all sound terribly complicated for little old ladies? Possibly, but it’s no more complicated than setting up email or any of a number of other things we might use. Just think of all of the options we have in a word processing application! However, there is also very good tech support from the people at EQ, as well as a detailed manual inside the program. Do you prefer a hard-copy book? You can order that separately, as well as other optional reference materials. This fantastic software Electric Quilt is available at electricquilt.com/…. We quilters have come a long way!